Here at Hog Roast Market Rasen we love to cook in market towns. They show an appreciation of locally produced goods, including cheese, bread, meat, fruit and vegetables, as well as local delicacies. In fact, if the name and the number of markets is anything to go buy then Market Rasen is probably the most enthusiastic town in England. The name means “place at the planks”, and references a market near to a plank bridge. Events are often held in the aptly named Market Place, which has been an integral part of the town for around 700 years. There’s a regular market every Tuesday, Friday, and Saturday, a monthly Farmers’ market, and country markets put on by the WI. In fact, they’re so keen on their local produce that the Tuesday market even features an auction of goods. That’s a lot of activity for a place once described by Charles Dickens as “the sleepiest town in England”! A love of local produce is important at Hog Roast Market Rasen, since we aim to keep our services locally focussed. We believe it’s the only way to provide a truly great service. We get to know the people and the area, allowing us to tailor our services in a way a giant, faceless corporation simply can’t. Tailoring our services is at the core of our business at Hog Roast Market Rasen. Not only do we look locally, we also offer a range of menus and meats. On offer is everything from hire of the machine (with or without meat), to informal barbecue functions, to fully catered sit-down meals with waiting staff and real tableware. You can have other meat instead of – or as well as – pork. Turkey is always a popular choice for Christmas functions, but we also offer chicken, lamb, and beef. All of them come with the traditional trimmings, so our pork roasts, for example, will always be accompanied by stuffing, apple sauce, and crackling. 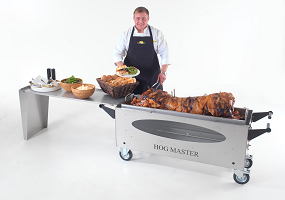 Our hog roast machines also come with the option of barbeque plates, so there’s the ability to cater for vegetarians as well as meat eaters. And if you’ve got fussy eaters, for whom the thought of a communal roast is too “out there”, we can also do burgers and sausages. Our chef will prepare everything on site while the roast is cooking, even sides of potatoes and salad. In fact, we’ll even do canapés and dessert for a truly memorable occasion. It all depends on the needs of the customer. For a small town, Market Rasen is a great place to cook. Not only do they love their food, but the town is full of pretty Georgian and Victorian buildings. Pubs make great venues for roasts, and period buildings make great pubs. There’s nothing like the warmth of 19th Century red brick, the air full of the scent of roasting meat, the place crammed with people enjoying a match or a live band, in anticipation of the treat to follow. In Market Rasen, that’s exactly what we provide.